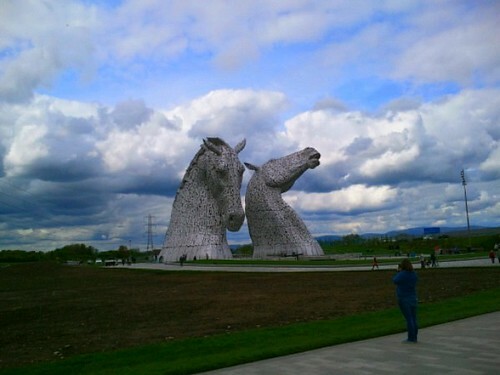 Two giant horse heads towering over the Forth & Clyde canal in Falkirk, Scotland, are, as per BBC, The Largest Art Installation in Scotland. 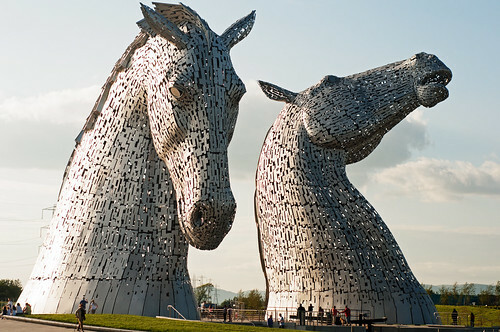 "The Kelpies name reflected the mythological transforming beasts possessing the strength and endurance of 10 horses; a quality that is analogous with the transformational change and endurance of Scotland’s inland waterways. 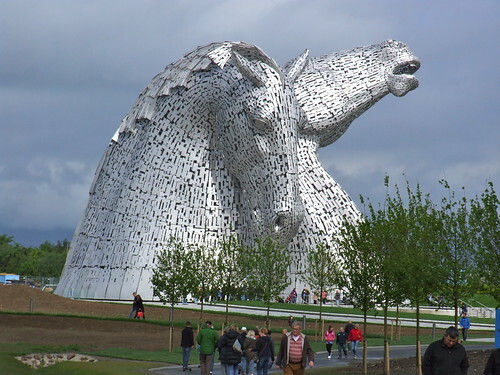 The Kelpies represent the lineage of the heavy horse of Scottish industry and economy, pulling the wagons, ploughs, barges and coal ships that shaped the geographical layout of the Falkirk area." The art work was designed by sculptor Andy Scott and the colossus heads are 30 metre (99 ft.) high, weigh 300 tonnes each. Made of structural steel with a stainless steel cladding, the sculptures are located within newly developed "the Helix" park, Falkirk, close to specially constructed lock and basin of the new extension to the Forth and Clyde Canal. Since its opening in April 2104 it has become a big tourist attraction. In addition to these giant figures, two sets of 1:10 scale models, known as Maquettes were also built. 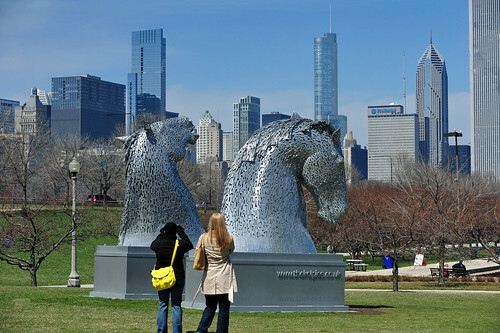 These have been displayed at many locations within Scotland as well as in New York and Chicago (See image below). Watch in Youtube which also shows inside view. More info and some great images in Kelpies Home Page and Colossal web site.